After 26 years together, Jennifer Gibson-Sargent never expected her closest connection to her brother to be strictly digital. But every day since his murder, Facebook is where she has spoken to him. Next to her own messages are hundreds of others, pouring out support for Gibson-Sargent and her family. They started the day her brother, Jeremy Gibson, was reported missing. He was found dead in July 2011. For Gibson-Sargent and anyone else who has lost a loved one in the digital age, it’s easy to see: Facebook is changing the way we mourn. Whether a death is criminal, accidental or natural, Facebook has become a go-to resource for sharing information, showing support and memorializing the deceased. “If used in the right way” seems to be the catch. No established social norms or expectations yet exist in the Facebook grief process. What to say — and when to say it — is left up to individual judgment. That’s always been the case, of course. 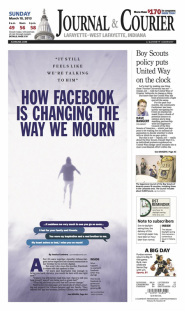 But Gibson-Sargent and many others in Greater Lafayette are learning the hard way: When it comes to death, Facebook is a blessing and a curse. After the posts on personal profiles came the public pages. Kaylin Glazebrook, Jeremy’s niece, began a “Justice For Jeremy” page to post photos and share information about the trials for Jeremy’s killers. Before long, it had more than 500 likes. Gibson-Sargent started her own Facebook group in memory of Jeremy. Some of the most comforting posts she saw were those that showed how much others were missing her brother, too. But for younger generations, a post-death Facebook post is as important as a personal response. Jacob Adams, 27, a Purdue University graduate student, said there is always pressure to post something. When a friend died in a drunken driving crash, Adams changed his status and posted on the friend’s wall. “You know everyone else is going to be looking at your post, so you want to say something good,” he said. On Facebook, as in life, questions arise about the “right” way to grieve. • If you call the family, should you write on the deceased’s wall too? • How well do you have to know a person to write something about them when they die? • If you change your profile picture to include a lost loved one, when is it OK to change it again? Mihaela Vorvoreanu, a Purdue technology professor, has spent her career studying technology’s sociocultural effects. Social norms haven’t fully adapted to the wired world, she suggested. Years ago, “You would not be such a close witness to other people’s tragedies. So now, we don’t know what appropriate behaviors are. In the weeks after her brother’s death, the focus for Gibson-Sargent switched from what others were posting to what she would post. While cleaning out his apartment, Gibson-Sargent and her mother found a list of Jeremy’s passwords. They decided to take over his Facebook profile. Without the password, she and her mother wouldn’t have been allowed to access the page. Facebook’s policy for deceased users is to either delete the page or “memorialize it.” Both actions can be requested only by immediate family members who show proof of the death via an obituary. If Facebook accepts a request to memorialize a page, no one can log into it and no new friends can be accepted. The page remains online, and only the late user’s friends can post to the wall. Nancy Eberhard, bereavement coordinator for Franciscan St. Elizabeth hospice, said posts of affirmation are frequently the most helpful. But immediate comments can be just as hurtful as helpful. Facebook’s ability to rapidly spread information can lead to family members finding out about a loved one’s death online before ever being properly notified. Kyle Rhodes died in a forklift accident at Fairfield Manufacturing in May 2011. Messages and statuses identifying him and the cause of death were posted before his wife, Jill, was called. Later Rhodes, of West Lafayette, discovered Facebook comments posted on a news story about Kyle’s death. “Someone wrote: ‘Who is stupid enough to step in front of a forklift?’ ” she said. When one of Jeremy Gibson’s attackers, Antonio Williams, died of medical complications before he could be brought to trial, for a time the “Justice for Jeremy” page turned in a direction that disturbed Gibson’s family. Deciding what to say about death has been an eternal struggle. When a friend’s daughter committed suicide, Sandy Oswalt, 67, who uses Facebook frequently, decided not to post about death — then or ever. If no requests are made, the profile exists as if the person still were living. For those whose deceased loved ones didn’t have a Facebook profile, a newly created page, such as Justice For Jeremy, is the next best option. Former Lafayette resident Ann Travnicek created a page for her mother, Christine Craig, who was killed in November 2009. At first, Help Catch Christine Craig’s Killer was all about finding Steven Farrell, who shot Travnicek’s mother. After he was found and brought to trial, Travnicek said the page was a way for her and her siblings to give their mother a voice. The page also allowed Travnicek’s family to post about their pain anonymously. Travnicek and her siblings all have access to the page, so when they write a post about their mom, it shows up on the Christine Craig page rather than their personal pages. Separating one’s grief and personal life can be a key to recovery. “Maybe it’s five years later, and you want to move on. But the Internet hasn’t moved on,” said Vorvoreanu, the Purdue professor. “The information is still out there. As weeks turn into months and months into years, Gibson-Sargent and her family have gained distance from Jeremy’s death. The investigation is closed, the killers have been sentenced and his name now seldom appears in the news. His sister checks Facebook every day, and every few weeks, new posts appear from Jeremy’s friends and her family’s supporters. Gibson-Sargent even looks to old posts written by her brother, especially to share with his sons, who were 1 and 2 years old at the time of his death. Down the road, she might post less often about Jeremy. Bereavement specialists say that’s what usually happens. Yet it’s comforting to know there is a place she can find support. Read the story at jconline.com here.